Aims: Our collaborative project between the University of Tasmania and the Tasmanian Medicare Local aimed to track the journey from Divisions of General Practice, the State-Based Organisation (SBO) and the Rural Workforce Agency (RWA) to the Tasmanian Medicare Local (TML). The last two decades have seen remarkable changes in the health landscape in Tasmania, and the evolution of Divisions into the TML had signalled increasing primary health care integration across Government, private and NGO sectors. ‘Telling the story’ of the journey was imperative to ensure valuable lessons learned along the way were not lost, nor major contributions underestimated. In the process of exploring the journey, the next iteration of Primary Care Networks (PCNs) rose over the horizon, making the chronicling of change even more significant. Methods: Two researchers from the Centre for Rural Health worked with a steering group from the TML to identify key players in the TML, the three former Divisions, SBO and RWA to narrate their perspectives from the past and present, and identify their imperatives for the future. Twenty-seven indepth interviews were held, including current and former Board members, rural and urban GPs, State Government stakeholders, NGOs, current and former staff and other professional bodies. Relevance: The study is highly relevant in the face of further changes in primary health care infrastructure nationally, as well as concurrent State Government restructuring. In this rapidly evolving environment, valuable learnings and corporate memory are tapped, naming up both strengths and weaknesses of the antecedent organisations. Results: The study has indicated improved integration in the Tasmanian primary care setting, building on some notable phases in leadership in both Divisional and TML settings. 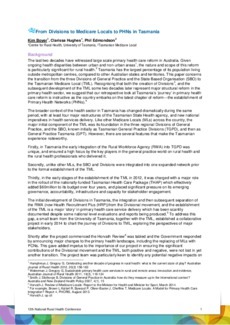 It also identified major challenges faced by the TML in both creating a new organisation from three regional structures and a small SBO and in also being required to lead and manage core aspects of the Tasmanian Health Care Package (THAP). The separation of the RWA (now Health Recruitment Plus) from the Divisional framework has not been seen as significantly disadvantageous to rural GPs, but GPs also identified a loss of collegiality with the demise of Divisions. Conclusions: The next iteration of primary care organisations needs to use the positive building blocks of the past, and to specifically address identified shortcomings. Rural primary care services are particularly at risk if new organisations fail to build on past gains.